One more month down and one more month closer to the Eau Claire Marathon! I had my last race before the Marathon, the Hot Dash 10 mile, which you should check out my race recap if you haven’t already. 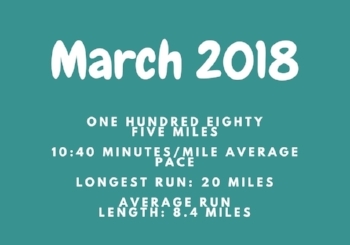 Mileage went up again in March, including hitting my first ever 50 mile week. Well, technically first two 50 mile weeks since this week is also 50 miles but my 20 mile long run is in April. I’m feeling super strong on my runs (even at the end of my 20 mile) and I’m going faster on them. Which isn’t always great news, my easy runs have been creeping closer to race pace and I need to pull back. Since my training has gotten more intense mileage-wise (and I’m also going to be trying out a spin class for my cross-training along with weights), I’ve upped my macros on most days. Which sometimes means it’s harder for me to get in all this food but I can tell it’s helping me feel better on my workouts. How was your March? Let me know in the comments!